Whodunit and suspense is a loved genre across all sections of moviegoers. Bollywood however rarely churns out such films. Films like GUPT, KAUN, TALAASH, RACE etc. have been loved and had an intrigue value as these had the suspense element. Now ITTEFAQ, a remake of the 1969 film of the same name, is out and also promises some great suspense-laden entertainment. So does it shock the audiences or turns out to be a boring, predictable fare? Let’s analyse. ITTEFAQ is the story of a two strangers who meet one night amidst killings and double crossings. Vikram Sethi (Sidharth Malhotra) is an acclaimed writer from London who is India for the launch of his third book. He goes to the hotel room post the event and finds that his wife Katherine (Kimberley McBeath) is no more. He calls the cops who try to frame him for the death. A paranoid Vikram runs away and takes refuge in the house of Maya (Sonakshi Sinha). When cops reach Maya’s residence, they realize that even her hubby Shekhar Sinha (Samir Sharma) is dead and Vikram is accused of murdering him. Dev Verma (Akshaye Khanna) is given the charge of investigating this high-profile case. Vikram maintains that he’s innocent and that he neither killed Katherine nor Shekhar. Meanwhile, Maya alleges that Vikram killed Shekhar. Dev is torn between the two versions of the story, and will not settle till he finds out what happened that night. What happens next forms the rest of the film. Abhay Chopra, Shreyas Jain and Nikhil Mehrotra’s story is inspired from the original ITTEFAQ but a lot of changes have been done. These changes however are quite weak and take the film down. Abhay Chopra, Shreyas Jain and Nikhil Mehrotra’s screenplay is okay and not engaging or gripping as required for a suspense, murder mystery. 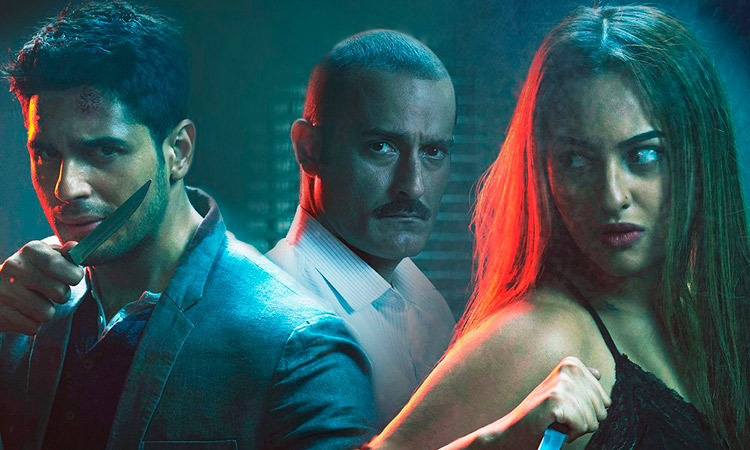 ITTEFAQ starts on a thrilling note and the initial set up of the premise is intriguing. However, the film starts getting disappointing as it progresses further. The pace of the film is very slow. It’s just 107 minute long and yet, it gets boring and drags in the middle as nothing much is happening. Moreover, the film rests on a waferthin plot. There are only two suspects and hence the audience knows that one of them is indeed the culprit and therefore the identity of the culprit does not come across as a surprise. Ideally, there should be a lot more characters in a murder mystery so that one can never correctly guess the identity of the killer. That advantage is not there at all in ITTEFAQ. Moreover, it’s a dark film with no commercial aspects as well as songs. And most importantly, the film is riddled with huge loopholes and it’s shocking how these things got overlooked by the makers! The shoddy investigation done even by such an able police officer in the film is shocking. Abhay Chopra, Shreyas Jain and Nikhil Mehrotra’s dialogues are interesting and witty in the first hour and that’s about it. In the later part of the film, there aren’t any interesting one-liners. Abhay Chopra’s direction is decent for a first-timer. But thanks to a flawed script, there’s not much he could have done to salvage the film. The climax of this film does shock but it comes too late in the day. As a result, it doesn’t startle you like it was intended to. Talking of performances, Akshaye Khanna shines the most. He gets completely into his character and gives a tremendous performance. His dialogue delivery is spot on. What’s interesting is that he played an investigating officer in MOM as well earlier this year but one won’t be reminded of that film while watching him in ITTEFAQ. Sidharth Malhotra gives a good performance. He underplays his part very well and in several scenes, he raises the impact with his restrained performance. Sonakshi Sinha is fair and keeps her performance believable. Even in the scenes where she tries to seduce Vikram, she keeps her performance subtle and that works well. Samir Sharma doesn’t get much scope but is fine. Pavail Gulati (Chirag) looks dashing and leaves a mark in a small role. Kimberley McBeath gets no scope. Ajay Jadhav (Constable Tambe) is hilarious and brings the much needed humour in the film. He’ll surely be loved. Trupti Kamkar (Mrs. Kawatkar) overacts but it was the need of the character and it comes out well. Others like Vinay Sharma (Inspector Kadam), Himanshu Kohli (Inspector Gautam Kohli), Sujata Jog (Maid), Forensic analyst (Arpit Sharma), Sandhya (Sanyukta Timsina) and Sandhya’s father (Jitendra Shastri) are fair. Mandira Bedi (Gayatri Verma) is wasted. ITTEFAQ is a songless film. But BT and John Stewart Eduri’s background score is in sync with the film’s theme. The slightly loud theme in the end works well. Michal Sebastian Luka’s cinematography is very good. Nitin Baid’s editing should have been slicker, especially in the middle portions. Bindiya Chhabria and Narii's production design is a bit theatrical when it comes to Maya’s residence. But it’s quite real in the police station scenes. 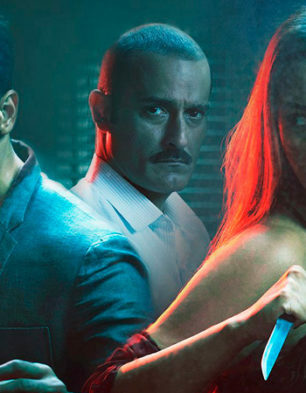 On the whole, ITTEFAQ is a weak show and doesn't get the grammar of whodunit right. The film is devoid of entertainment value as well as the shock element. At the box office, it will fail to make a mark.